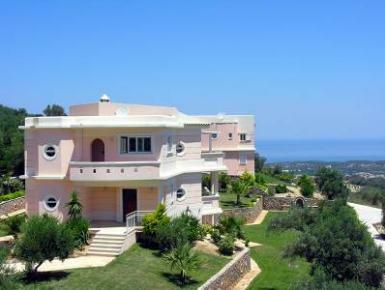 The Villa is built in three levels surrounded by a stone wall and a beautiful verdant yard. A pool and barbeque facilities can be found outdoors, while indoors there are 5 bedrooms, 5 bathrooms, a fully-equipped kitchen and a large living room with a fireplace. The villa is air-conditioned, tastefully designed and offers a marvellous view of the mountain and ocean scenery from its large veranda and balconies. It has three levels and is built in a contemporary architectural style, in shades of white and peach. It is surrounded by a stunning verdant yard, a stone-tiled veranda area and a stone-brick wall.